To say I’m excited for today’s post would be a massive understatement. It actually feels a bit like Christmas around here because one of my biggest dreams has come true: we converted an old, vintage crib into a couch. 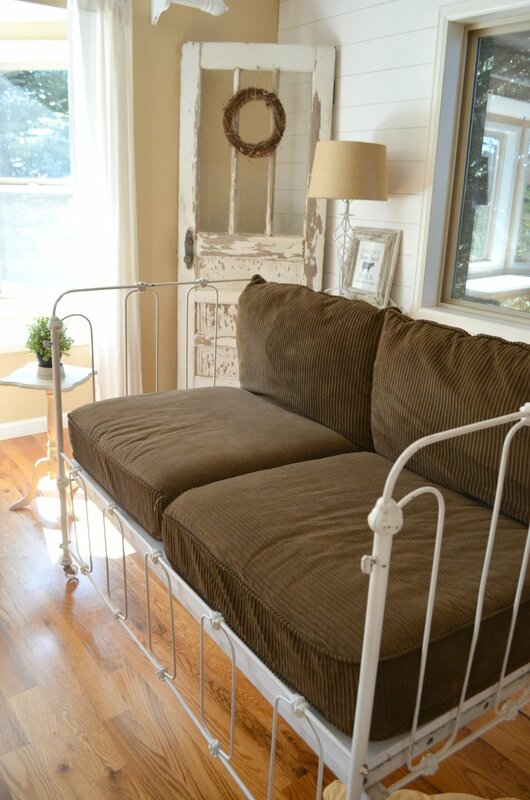 Yes, a real-life, super comfortable, adorable couch. And yes, this is literally what my dreams are made of, but that probably doesn’t surprise you. Here she is! I can’t even begin to tell you how much I love this. If you follow me over on SnapChat (you can find me at lilvintagenest) you have already seen little sneak peeks of this crib. I posted a few videos when we first got it because I couldn’t wait to share. We actually got this from my husband’s aunt, who apparently had this sitting in her storage shed. Crazy, I know. It ended up at my in-law’s house and they offered it to me. Of course I said yes and told them how I’d love to convert it into a couch. My super skilled father-in-law actually did the hard work to make this possible, so all the credit goes to him! So when we got the crib it had the traditional 4 sides like all cribs do. Well my father-in-law actually took the front panel here and attached it to the lower half of the crib so it would be nice and open like a couch. If you look closely you can see how he attached it on the bottom legs. Amazing, right?! Next he built this wooden insert that sits where the crib spring traditionally would. This thing is solid and provides a ton of support. 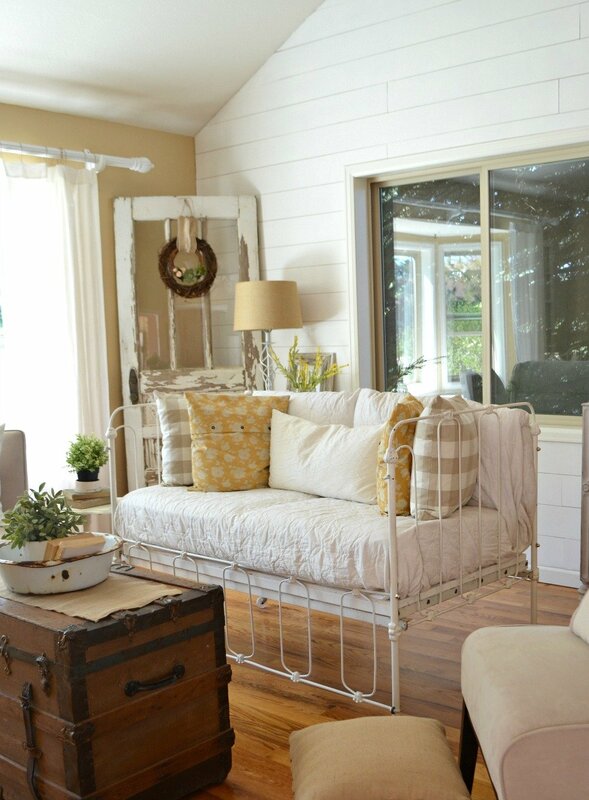 Perfect for lounging! I ended up painting the edges of this platform white so it would blend in with the crib. Next up in the process of converting this to a couch was cushions. So my original plan was to use a crib mattress and add in a ton of pillows. 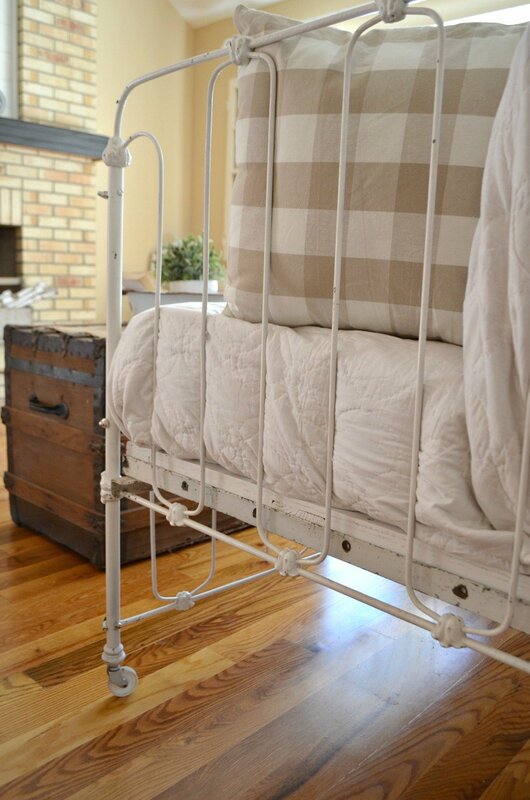 BUT it turns out a traditional crib mattress was too small, we had about 2-3 inches on either side of the mattress when I put one on the wooden platform. So I grabbed the cushions off our old loveseat, which actually used to be in the basement, and LOOK WHAT HAPPENED. A perfect fit. I could hardly believe my eyes. Ironically, we have been trying to sell the old couch with no luck, so I think this match was meant to be. I’m not exactly sure yet what we’ll do with a cushion-less couch just sitting in storage, but this fit was too perfect to pass up. 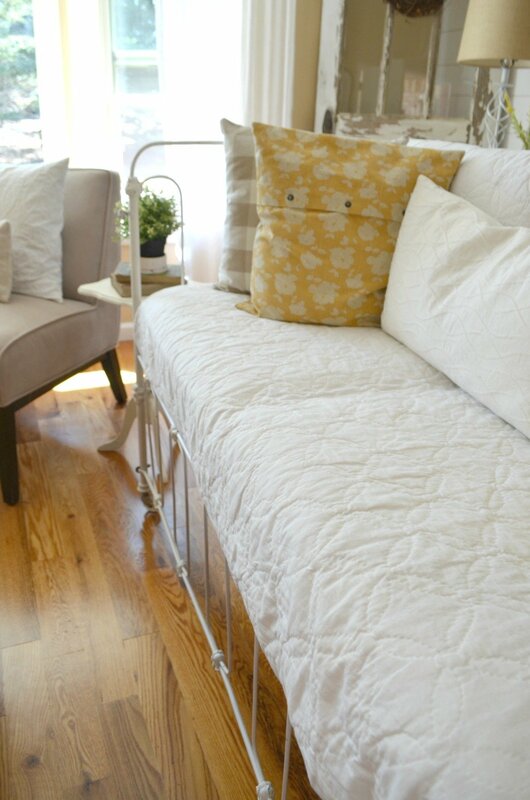 All I did was tuck an old white quilt around the cushions and it works perfectly. 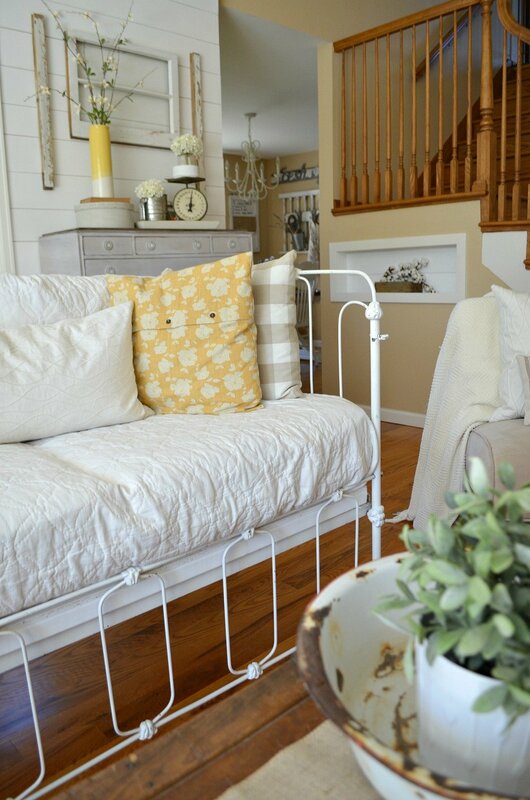 I’m so obsessed with this crib I literally have to stop myself from sharing more photos. I looooove it. And it’s so cozy and comfortable! Thanks to those giant cushions, this actually feels like a real couch. 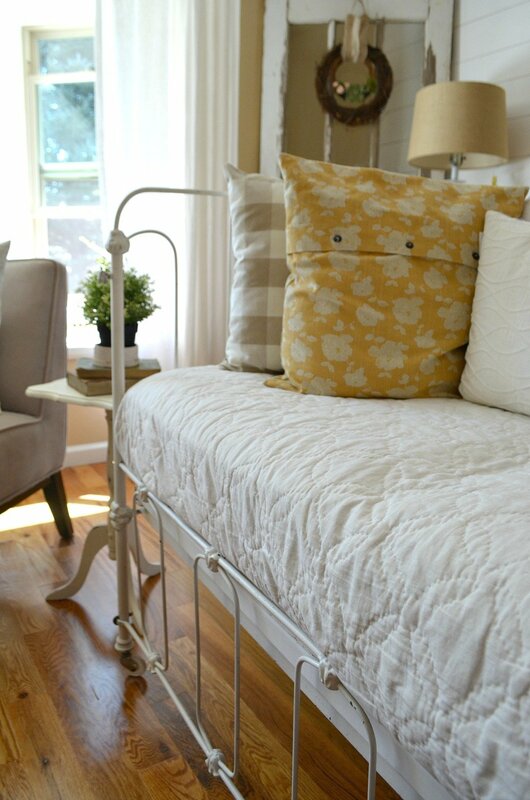 It 100% functional and useful, which isn’t always the case with vintage finds. My father-in-law did an awesome job putting it together for us and I’m so thrilled with how it turned out. I’d love to hear what you think of my crib-couch in the comments below. And feel free to ask any questions you might have. Really, I love hearing from you. Thanks so much for stopping by! And as always you can find me on Pinterest, Facebook & Instagram. This is absolutely beautiful. I love you style and looked forward to each blog you post. I’ve gotten many ideas from you. And like you I get giddy reading you posts. Thanks for sharing with all of us. Soooo cool! Perfect spot for coffee and chit chatting! Oh I love it! Likeir Sarah I look forward to each post that you do, you have really inspired me. 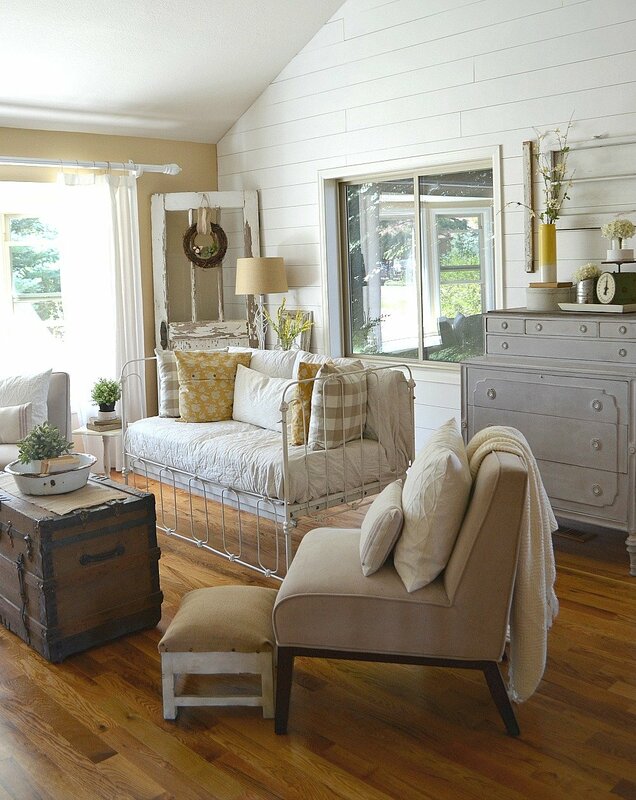 It will take me a while but I’m so happy to finally know what I love and that’s farmhouse style! Wow! Congrats on this find and amazing transformation. It is stunning! Love it -as well as everything else in the room! 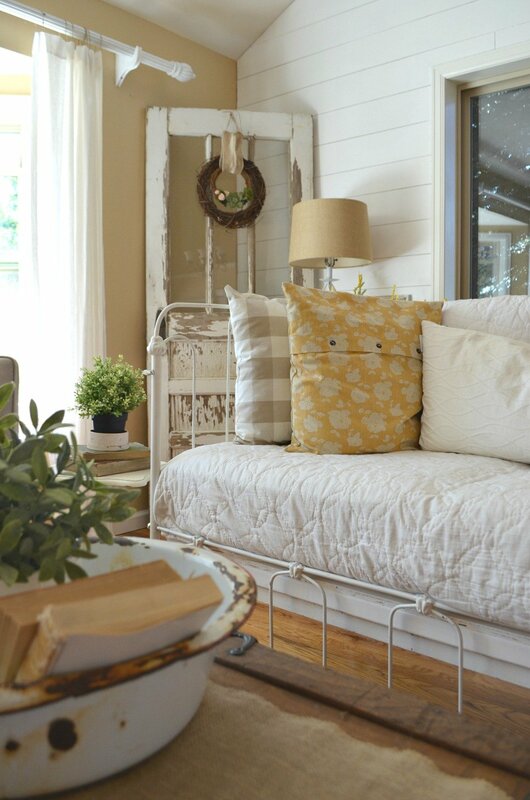 How do you have you’re curtains hanging from the rod and are the buffalo check throw pillows Ikea emmie ruta? Did you make them or buy them like this? I just bought the emmie ruta twin duvet covers and am using them to make curtains for our bedroom -they were on sale for $19.99 each -(I couldn’t even have purchased the fabric for that). 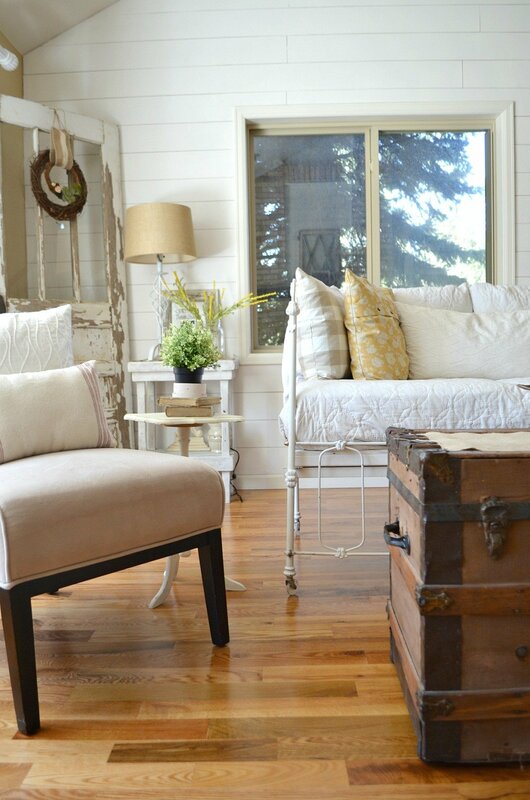 Your nest is just beautiful and full of inspiration. I absolutely love this!! 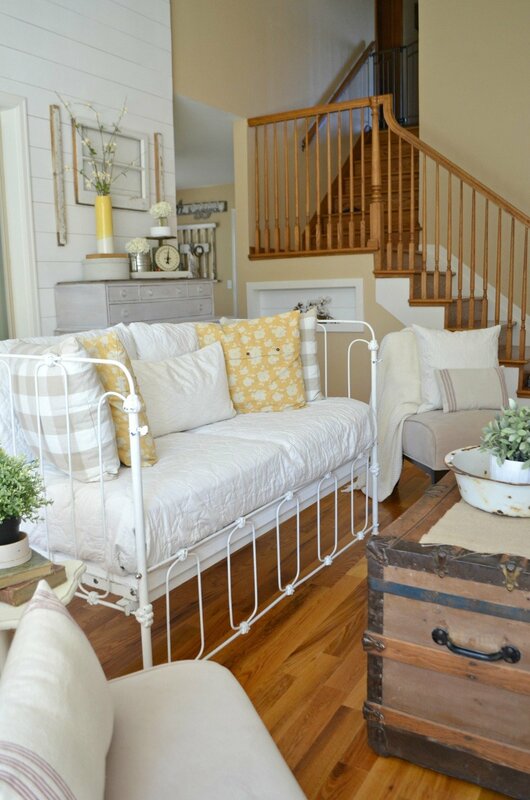 I hope to find a vintage crib somewhere very soon so I can try it! Thank you Emily! I hope you can find one! I love it! 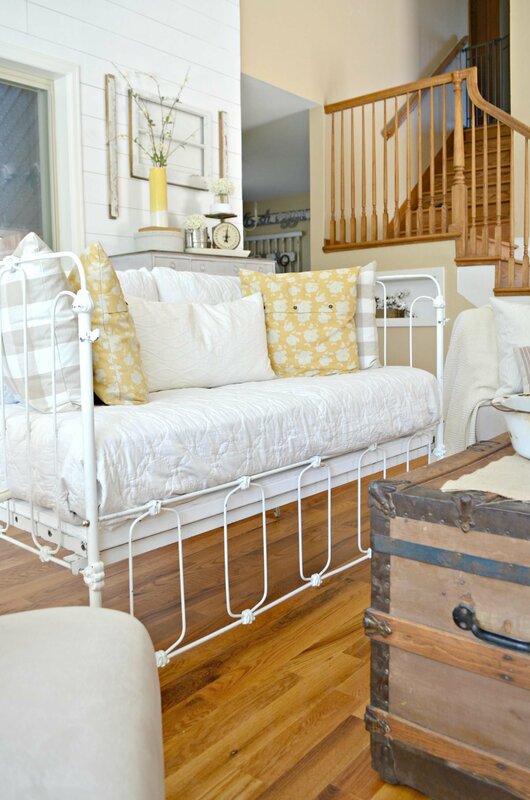 Super cute and creative way to have additional seating. I have a question for you. 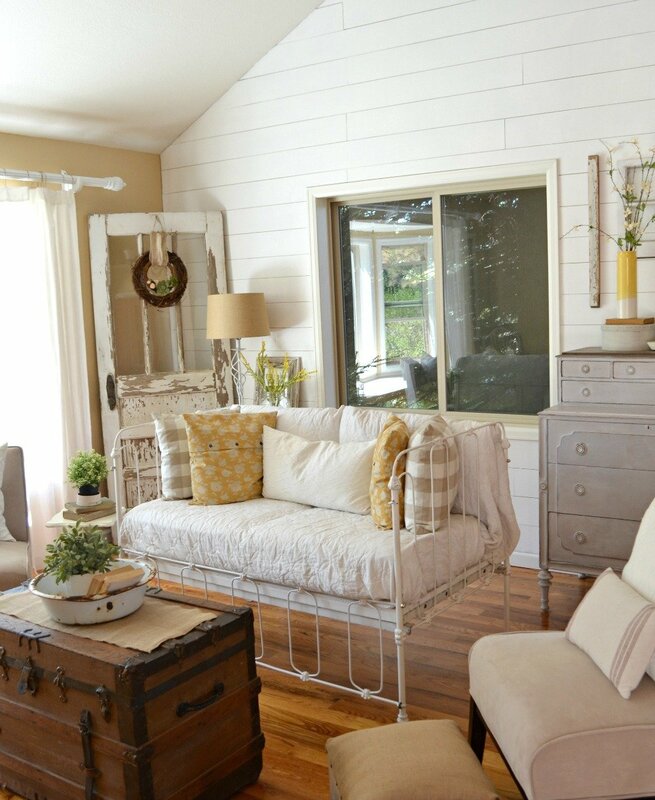 What type of slipcover/cover did you use for the cushions? 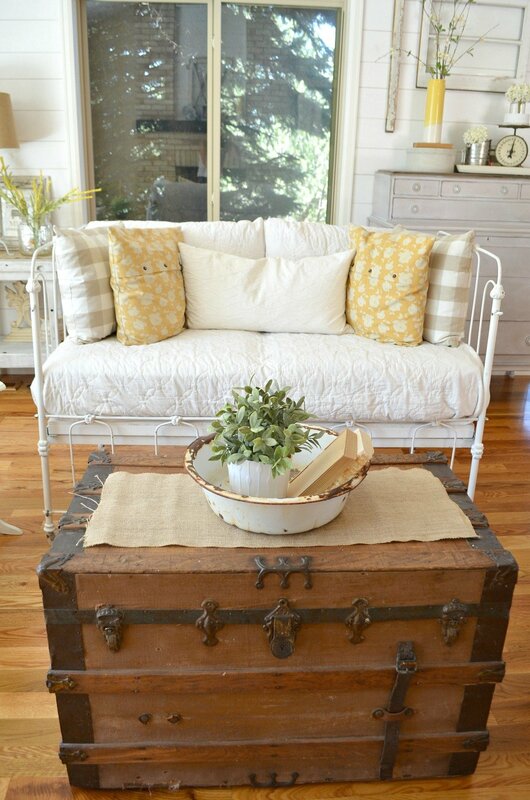 I have looked at stores for slipcovers and they seem to be pricey and nothing close to cuteness I see in the pictures above. 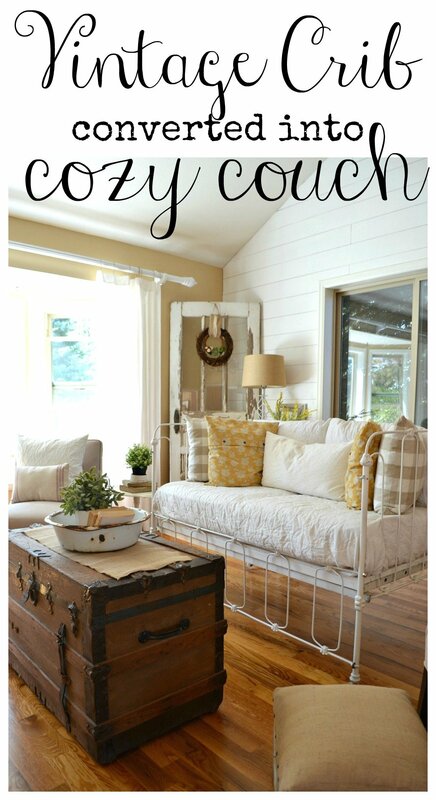 I adore your style and your DIY projects- always look forward to new posts. Thanks Amber! Yes, slipcovers are super pricey and most of the time I don’t even like the ones I find. So I just tucked a white quilt around the cushions. Works perfectly! 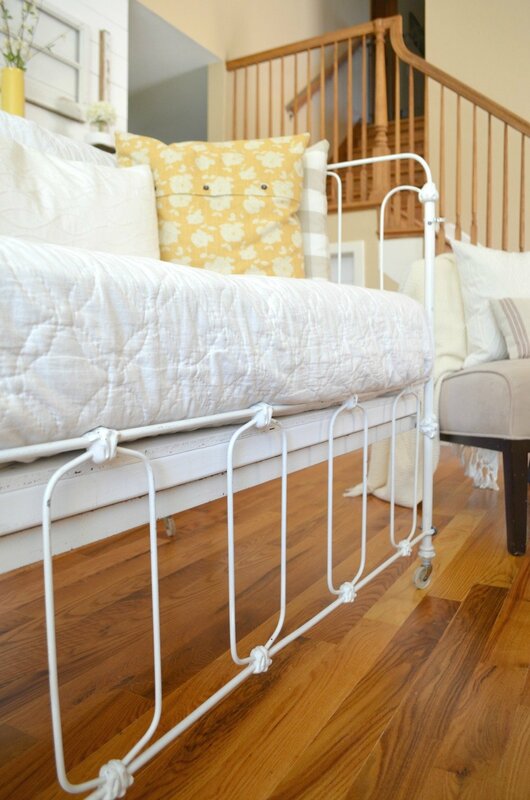 I just found this crib on Pinterest and it led to your blog I have this exact same crib! 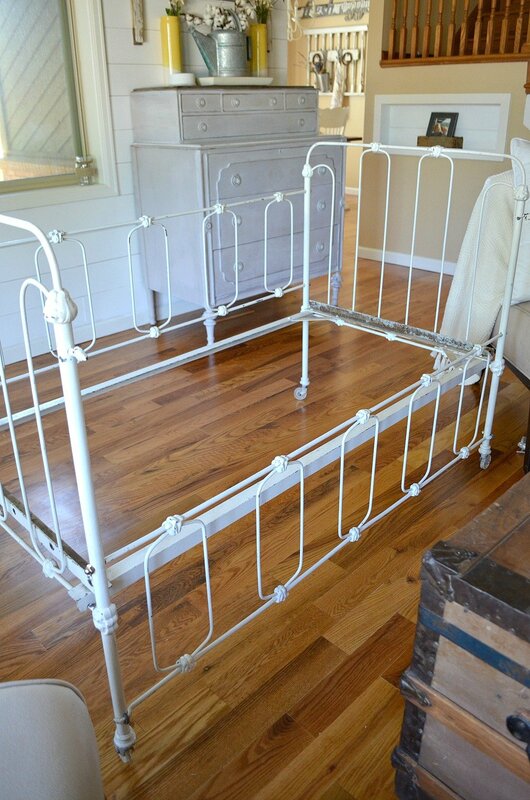 I just got it out of the shed this past weekend to convert to a tiny daybed for my 2 year old granddaughter when she comes to stay. However mine must be smaller because it is only 24 inches wide by 48 long and a standard crib mattress will be too large. I am leaving mine chippy and will seal well with sealer and custom make all the bedding using a new dense 4 inch foam. You will be able to see it on my blog when I get it done in Nov. Oct. Is full with a wedding ( I’m making her dress) and the arrival of my son’s first baby! That sounds awesome Terry, I’ll definitely check out your blog! Just found your blog today and I’m excited to investigate further! 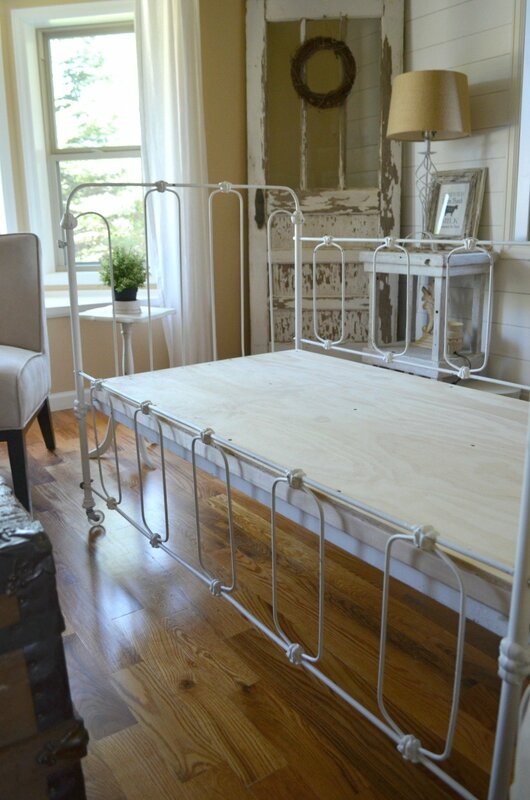 I have an antique crib I used for our daughter (she’s 26 now) and am inspired to convert it. I don’t have an old quilt but I imagine I can find something to cover some cushions. Did you use separate pieces for the back cushions? Or, are they the same quilt but just look like they’re separate? Happy New Year!! Hi Cyndie!! I actually used one large quilt, I believe it’s a queen size, and it covered the whole thing–I just tucked it in around the back and bottom cushions. So glad you found my blog! Hi Eileen! It’s Autumn Blonde by Sherwin Williams. 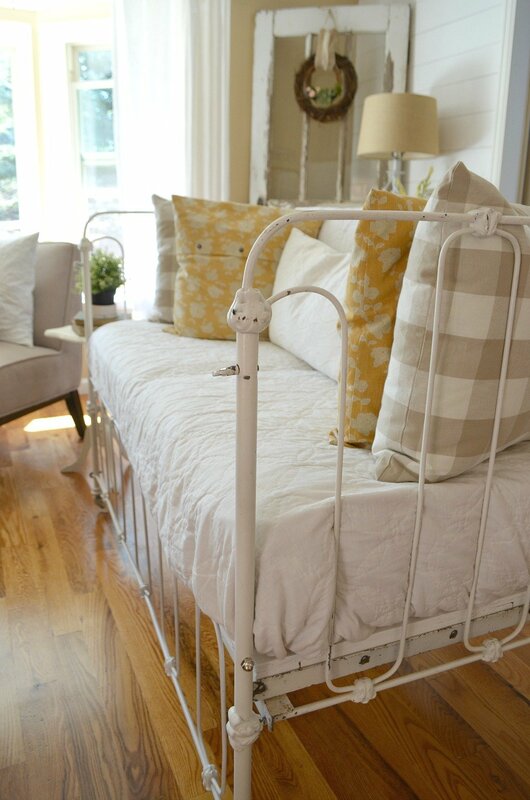 I have my baby crib which is a white brass crib that I have used as a couch since my college days. I love what you did with yours to make it more comfortable ( I have a crib mattress) and the farmfouse touch with the quilt. Mine is about to get an update. Thank you for the inspiration. Love the crib. I just found a very similar one. 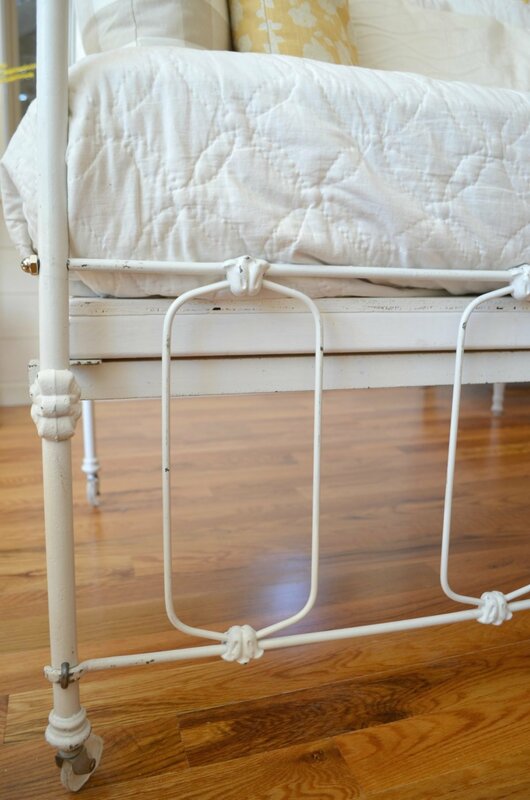 My question is: how did your father-in-law attach the bottom part and did you leave the springs on? 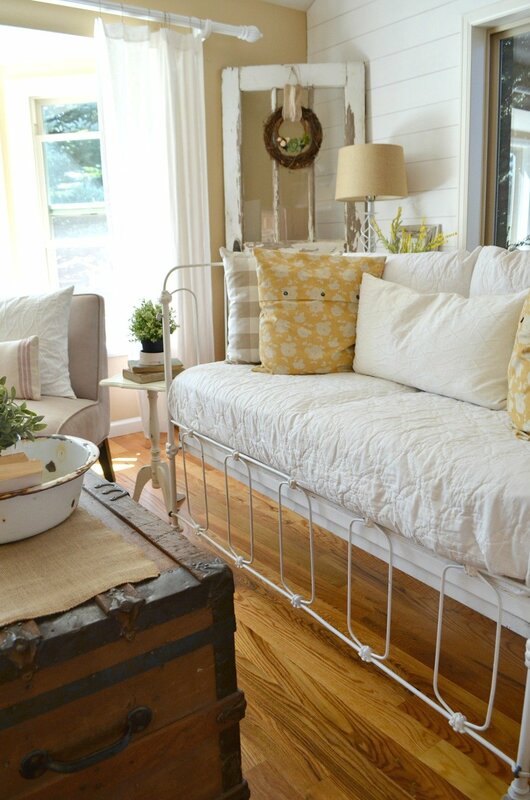 I love this beautiful crib/couch. 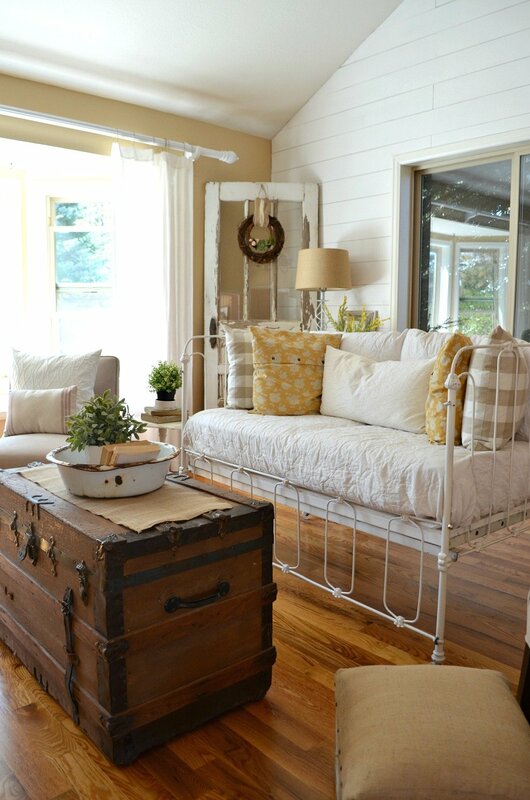 I love usable vintage items. Thanks for sharing.